Tarnovsky, Mykola M. [Тарновський, Микола; Tarnovs’kyj; pseuds: Ostap Ochko, M. Haliada, Yurko Slyvka, Emmanuil, M. Shcherbak, M. Naraivsky, M. Dumka, and Mykola Mykolaiovych], b 1 January 1895 in Kotsiubyntsi, Husiatyn county, Galicia, d 20 June 1984 in Kyiv. Ukrainian-American and Soviet writer. He emigrated to New York in 1910. He was active in the Ukrainian Federation of the Socialist Party of America, the Communist Party of America (from 1919), and the League of American Ukrainians (secretary, 1952–5, and president, 1955–8). 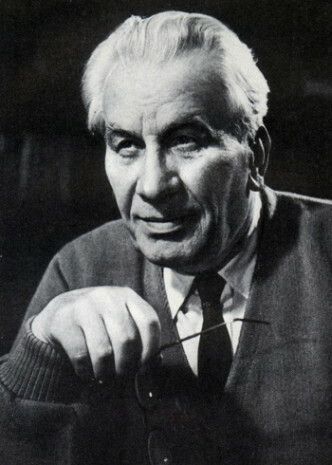 In 1958 he returned to Ukraine and became deputy head of the Ukraina Society. Tarnovsky began publishing poetry in the Ukrainian-American press in 1915 and was an editor of such periodicals as Robitnyk (Detroit), Molot, Smikh i pravda, and Ukraïns’ki shchodenni visty. In the 1920s he belonged to the ‘transoceanic’ branch of the Soviet Ukrainian proletarian writers’ group Hart and to Zakhidnia Ukraina. Most of his works depict the hardships of Ukrainian immigrant life. Others attack the ‘bourgeois nationalists’ or glorify life in the USSR. They include the poetry collections Patrioty (Patriots, 1918), Shliakhom zhyttia (Along the Road of Life, 1921), and Velyke misto (The Big City, 1926), the novel in verse Emihranty (Emigrants, 1958), and the prose collection V zaokeans’kii hushchi (In the Transoceanic Thicket, 1964). Several large editions of Tarnovsky’s selected poems were published in both New York (1951) and Kyiv. B. Burkatov published a book about him in 1964, and a book of his memoirs was published in 1979.